When finished properly, bay windows can be one of the strongest design elements in a room. The large window let in lots of natural light and can add a graceful feel to any room. There are 4 primary approaches you can take when decorating your bay window. In this article we will discuss each of the styles. In all cases, window treatments play a key role in defining the space. Fundamentally, you must decide whether you would like to treat the bay window as one large unit or as several individual units. When using the outside the bay approach, the windows are treated as one single unit, with the curtains hanging outside the bay. One feature that you would typically look for if you wanted to use window treatments in this way is the presence of ample header space. This will allow you the space you need to hang a long, straight curtain rod for floor- to-ceiling panels. When the curtains are open, they serve as as decorative frame for the space and the view beyond. 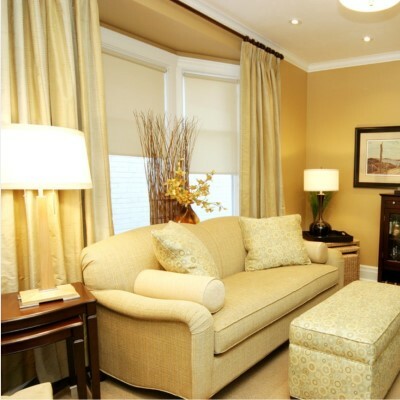 The softness of the window treatments is a necessary addition to the hard edges of the bay window construction. When the curtains are closed, the bay disappears into a snug nook and (possibly) can serve as a backdrop to other furnishings or features which are in close proximity. Instead of treating the bay window as a single unit, you may wish to treat each window as an individual piece. Each window within the bay will have its own individual window treatment which is mounted inside the bay, While each window treatment is separate, they all work together in harmony. In this case you would use a single angled rod which is custom-made to fit perfectly inside the shape of the bay window. 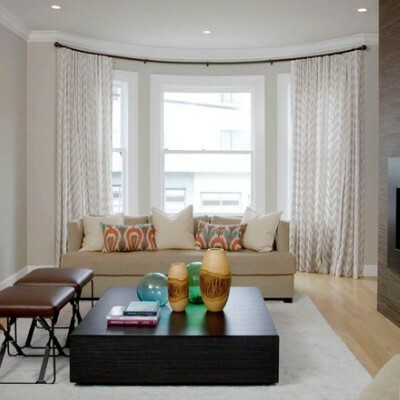 The window treatments can be full-length running to the floor if there is no built-in seating, or they could be shortened to accommodate built-in features in the bay area. Two variations are more private and less private. The more private approach would include individual coverings, such as shades or shutters for each window. With decorative drapery panels flanking the sides of the bay window. The less private approach would include only slender panels flanking the bay on either side. This idea is less for privacy and more for the softness and pattern. 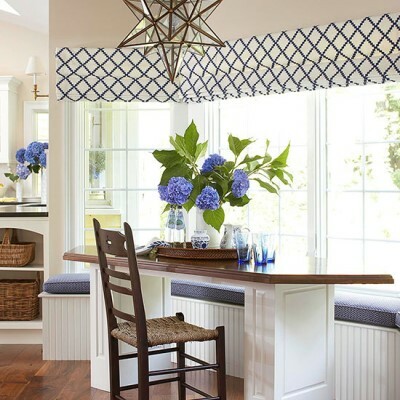 Another approach to decorating the bay window area with window treatments as one coordinated unit is to choose individual treatments that conjoin. For example , using individual shades, blinds or shutters that cover each individual window, mounted to the outside of each window and sized so they fit snuggly against each other - creates an effect of melding the windows together visually. This can be done with nearly any type of window covering - so long as it is mounted outside the molding and meets at the edges. 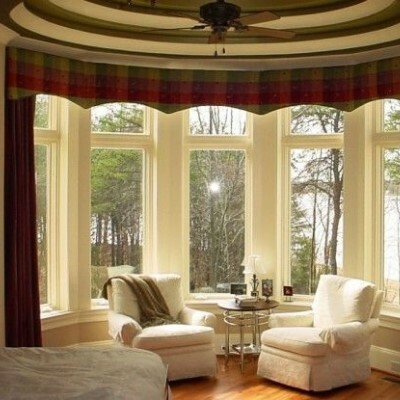 The addition of a single, long valance which spans the tops of all the windows can add to this effect. A final options would be to use cafe curtains which would be mounted across the window's midsection. No matter how you approach it, the effect is the same - use individual window coverings in a way that creates the appearance of a single unit. Another approach for finishing bay window with window treatments is to treat each window individually. Each window is dressed separately. each treatment is mounted inside the window moulding. Unlike the windows in unison approach, these treatments are designed NOT to touch on the edges, the bay will still appear uniform and contiguous. 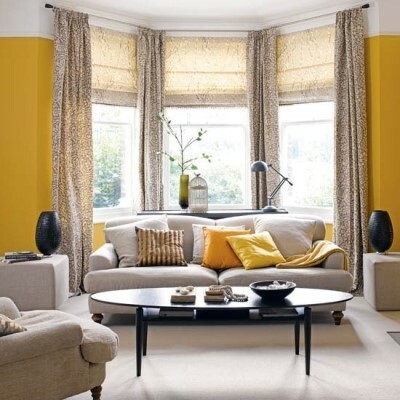 You can use plantation shutters, curtains, shades, etc - just about any window covering will work. This approach can be further enhanced by a valance which would cover the top portion of the window or you may use stationary side panels.